Catering to the expectations of the customers, we are engaged in importing, supplying and exporting an exemplary array of First Aid Products. These products are sourced from the well-established and reputed manufacturers so as to ensure their quality in tandem with the international standards. 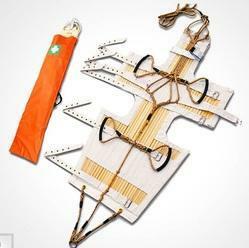 Offered products are highly demanded by the customers for their quality and durability. As per the clients varying demands, we are providing these products in different sizes and designs. Furthermore, our client can get the offered products at reasonable price range. Our range includes Stifneck Select Extrication Collar, CPR Pocket Mask, Folding Stretcher, Spin Boards, Ambu Bag and various other products. Light Weight, easy clean, anodized aluminum alloy framework. Unfolded Size (LxWxH): 215x55x14cm. Folded Size (LxWxH): 56x22x20cm. Self-weight: 8 kg, Load Bearing: 159 kg. *It is quite firm and light, easy to clean and operate. It is the ideal product not only to the patients but also to the operators. *Twin safety lock for smooth and unbinding locking and unlocking. *The thermally-treated polymer material will not make the patients too hot or too cold, the surface is easy to clean and impervious to fluids..
*It is a separately-type stretcher to transfer fractured and serious patients. *At both ends of the stretcher, a hinged and joined arrangement is set in the middle, which can set the stretcher into two parts and it is easy to lock and unlock. *The stretcher can strengthen the patients at original place; it can reduce the further hurt of the patients, the patients can be quickly & easily put in the stretcher and also the stretcher can be taken out from the back of the patient without moving the patient. 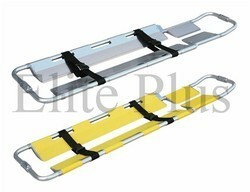 *The length of the stretcher can be adjusted according to patients’ body. The foot end is designed as a narrow-frame structure. *It is made of high-strength aluminum alloy materials. *It characterized by its being light-weighted, small-sized, easy-carried, use-safely and easy for sterilization and clean. 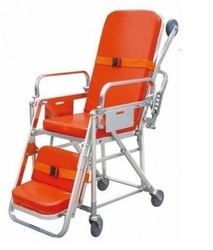 *It’s mainly used for hospitals, sports, ambulance carrying patients and wounded person. 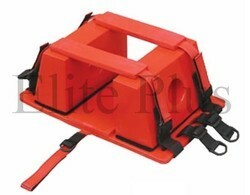 The Mobilize(TM) Stretcher PS 101 is used by virtually every rescue team in any rescue scenario including the military, emergency rescue services and industry whether oil and gas, mining, construction or anywhere there may be a need to have a solution to a real or potential danger or hazard. All our Pole Stretchers feature heavy duty aluminum poles for easy handling and heavy duty, vinyl-coated nylon covers that resist stains, blood and bodily fluids. 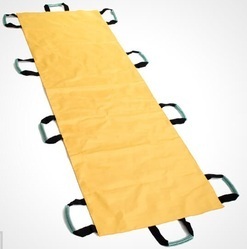 Nonslip handgrips help EMTs keep a firm grasp on the stretchers. 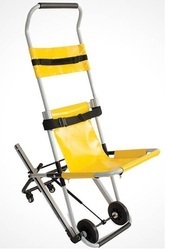 The Mobilize EVAC-CHAIR Emergency Evacuation Chair enables evacuation of less mobile persons in emergency situations. The chair hasthe ability to easily and smoothly transfer a person down a flight of stairs with only a single operator. The Premium Mobilize EVAC-CHAIR Emergency Evacuation Chair enables evacuation of less mobile persons in emergency situations. The chair has the ability to easily and smoothly transfer a person down a flight of stairs with only a single operator. Aluminum frame light and easy to handle, strong and durable.Positivie locking hinge mechanism ensures chair is locked in place whether deployed for use or folded for storage.Ergonomic, five-position lift bar nd handles reduces strain of lifting for oprtators of various heights .The chair is designed to provide security to a user when being moved and is fitted with a forehead restraint, safety buckles, and a slingstyle seat that ensures the user is sat back in the chair and cannot be tipped forward. The Emergency Evacuation Chair's wheels are supported by specially designed friction belts that ensure the chair does not slip or accelerate too rapidly while descending a flight ofstairs. The distribution of the chair's weight and load also ensure that the descent is smooth and comfortable for both the user and alsothe operator. A lightweight and carry sheet designed for emergency personnel evacuation. 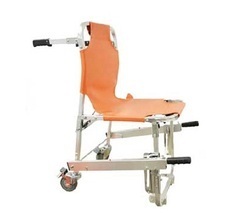 The MOBILIZE CSR 801 Carry Sheet stretcher is widely accepted as a vital aid in the rapid evacuation of non-ambulance patients from hazardous situations. Casualties are carried via the ten large wrap-around hand loops. It is instantly available in emergency situations. 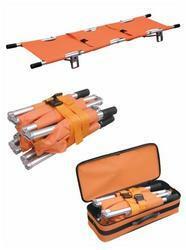 Constructed of heavy-duty rip-stop PVC vinyl, the Carry Sheet stretcher is easily cleaned and reusable. Can be folded and enclosed in a carry bag. This Vacuum Stretcher is made of insulative and cold-resisting PVC. 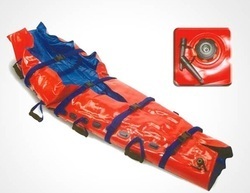 You can rapidly and safely adjust the stretcher to be soft or hard by using the double-action pump, which can be easily and quickly operated. It can be perfectly adjusted to the shape of the body in first aid to avoid second injury caused by disordered moving, such as cervical and vertebral hurt. It allows X-ray/ MRI examination, and it can be used in the patient transportation by road, sea, and air. Hao Bang vacuum stretcher is specially applicable for fist-aid centers, hospitals ,schools, the army gymnasiums and stations, where accidents occur frequently. 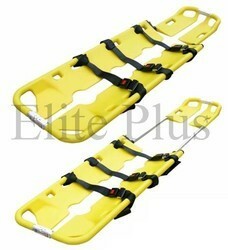 Paying optimum attention to the demands of our patrons, we are providing them Folding Stretcher. We collected it from our world renowned vendors who used superior-grade raw material for its manufacturing. Owing to its quality and excellent design, offered product is highly demanded in the hospitals, nursing homes and other medical centers. Client can get the offered product within affordable price range with assurance of quality as per the international standards. 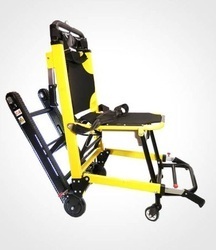 The Neil Robertson stretcher is designed for removing an injured person from spaces wherein access, doors, or hatches are too small to permit the use of regular stretchers. Spaces such as engine-room spaces, Cargo holds, Pump rooms, Boiler room etc. are few examples of such compact spaces on ship.